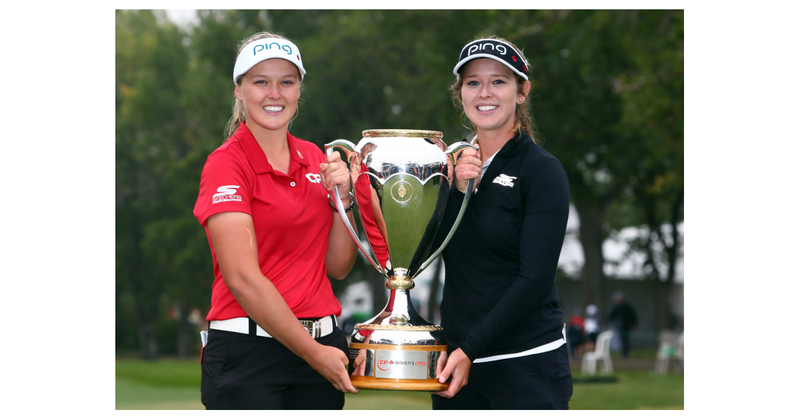 MANHATTAN BEACH, Calif.–(BUSINESS WIRE)–On the course with the world’s top golfers and surrounded by the cheers of fellow countrymen, Brooke Henderson won the LPGA CP Women’s Open yesterday, becoming the first Canadian to win the title in 45 years, and the second Canadian to win in the event’s history. Competing in Skechers GO GOLF footwear and apparel, Henderson won her seventh LPGA title by four shots with a finish 21 under par at Wascana Country Club in Regina, Saskatchewan. Henderson has become a prominent face of women’s golf since turning professional in December 2014. She won her first LGPA Tour event in 2015 at the Cambria Portland Classic, a title she would defend with her second career win in 2016. She then went on to become the second youngest player to capture a major championship with her win at the 2016 KPMG Women’s PGA Championship. In 2016, Brooke also represented Canada at the 2016 Olympic games in Brazil, where she tied for seventh place. In April she was the first Canadian to win the Lotte Championship and is now a single win short of tying Sandra Post for most wins by a Canadian in LPGA history. Henderson joined the Skechers Performance team in 2016. She wears Skechers GO GOLF footwear and apparel on tour and has been featured in ongoing marketing campaigns for the brand. Known for its lightweight, high quality, stable and comfortable designs, Skechers Performance GO GOLF has achieved prominence within the golf category, alongside the brand’s award-winning running, walking and training collections. The Skechers Performance GO GOLF apparel line offers athletes comfort and freedom of movement through a wide assortment of styles constructed with innovative moisture-wicking fabrics in a variety of colors for both men and women. SKECHERS USA, Inc. (NYSE: SKX), based in Manhattan Beach, California, designs, develops and markets a diverse range of lifestyle footwear for men, women and children, as well as performance footwear for men and women. SKECHERS footwear is available in the United States and over 170 countries and territories worldwide via department and specialty stores, 2,715 SKECHERS Company-owned and third-party-owned retail stores, and the Company’s e-commerce websites. The Company manages its international business through a network of global distributors, joint venture partners in Asia and the Middle East, and wholly-owned subsidiaries in Canada, Japan, throughout Europe and Latin America. For more information, please visit www.skechers.com and follow us on Facebook (facebook.com/SKECHERS), Instagram (Instagram.com/SKECHERS) and Twitter (twitter.com/SKECHERSUSA).